Well, she may not have the “authority,” but she certainly has the power to pressure Chief of Police Jeff Gilbert into a leave of absence while he is being investigated. 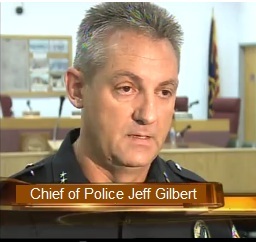 The Quartzsite Arizona blogspot posted a copy of the Notice of Investigation served on the officers for possibly violating “Personnel Policy” by reporting crimes allegedly committed by Chief Gilbert. Hardly a crime worth being suspended over, especially when compared to the charges leveled against Gilbert, who has not been suspended. These people swore an oath to uphold the laws and don’t care they’re breaking them? That’s ground for recall. Ironically, Lizarraga resigned last month to run for office in the upcoming Mayoral recall election. In his place, Martin Brannan was appointed, though he was recently reprimanded by the State Bar Association for prosecutorial misconduct in a murder case. Brannan ordered officers to contact the defendant without giving prior notice to his attorney. The detectives made several threats if he did not waive his legal rights. Their actions resulted in a dismissal of all charges against the defendant, though that dismissal is being appealed. How’s that for abuse of process? But it parallels Chief Gilbert’s false arrest of anyone who criticizes him or the City Council. Though state and federal laws are being openly violated, the state has yet to stop any of it. Of course, this is the state where its Chief Federal Judge, John Roll, was killed (along with five others) and Member of Congress Gabriel Giffords was shot in the head this past January when a “lone gunman” staged a shooting spree, hitting 19 people. Giffords was released from the hospital last month, though she will undergo daily physical therapy, possibly for years. Incidentally, the shooting occurred after President Obama claimed the power to order extra-judicial killings. Rady Ananda specializes in Natural Resources and administers the sites Food Freedom and COTO Report.